Correspondence between leading figures of the international feminist movement, from America, Australia, Europe, Britain and New Zealand (including Carrie Chapman Catt, Lucy Stone, Emily Davies, Eva McLaren and Amy Delay). Her Subject Files and Minutes of the NUWSS. Papers of the International Woman Suffrage Alliance and of the International Council of Women, 1911-1920. Newspaper cuttings (1876-1911) and pamphlets on Women's Suffrage (1866-1919). 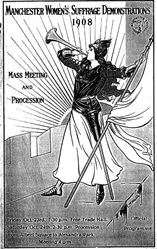 Papers on the Men's League for Women's Suffrage, the Women's Franchise League, the Women's Freedom League and the Women's Social and Political Union.